The MC1000e-J joystick controller is designed for coarse micron level positioning of our 800 and 7000 series actuators, manipulators, and stages. 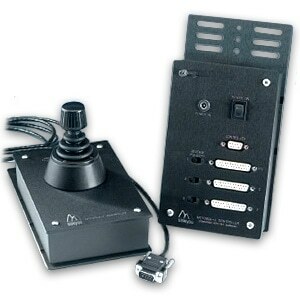 The joystick control is proportional from slow to high through the travel range of the joystick motion. A two-position rocker switch is conveniently located on the top of the controller. The “rapid” setting is set to maximize speed (1.7 mm/second) when the joystick is moved to its farthest position from center. The “slow” setting is set to maximize resolution (0.2 μm, 30 μm/second). Polarity switches on the junction box allow the joystick motion to be set to match the output of the device being driven. This feature ensures intuitive interaction between the joystick operator and the operation. The controller uses encoder feedback from the motor to drive the device. This encoder coupling enables the use of the DR1000 digital readout for repeated positioning requirements. The MC1000e-J uses a wall mounted power supply as its source for clean DC power. All cables are shielded and a central ground lug is located on the junction-box to ensure noise-free operation during sensitive electrophysiology experiments.